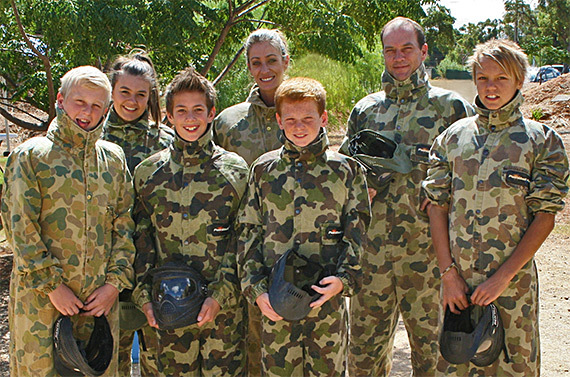 Have the best and most talked about birthday of the year at Paintball Park, Adelaide's biggest and most developed paintball venue. You will be issued with the best rental equipment available including a Tippmann 98 semi-automatic paintball gun, custom camouflage overalls, free hire of a padded vest if required & a paintball mask from one of the world's leading brands. 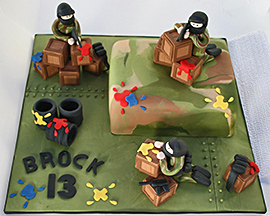 Paintball Park has been running action packed birthdays for 9 years. Our onsite manager has been heavily involved in paintball for approx 20 years and is one of the most experienced paintballers in South Australia. Paintball Park referees have a variety of skills from military weapons training to being some of the best paintball players is South Australia. Whatever our individual skills advantage is we are all friendly & professional. We know paintball & we love paintball, so your group is sure going to have a great day paintballing with us. Large and small birthday groups are always welcome. If you have a small group & want extra players there are often other compatible groups that want extra players too. If you have a small group or want extra players contact us and we can inform you of the compatible session times. Parents are welcome to join in for fun & piece of mind. Parents that play in kids groups play to the kids abilities & often comment how good the kids are. We think some of the parents have just as much fun as the kids. There are heaps of different games to play and different fields to play on. We may even give some special roles to the birthday boy / girl. Games can run all day up until 4pm. When they are done playing just leave the dirty overalls with us to wash.
Safety comes first & then we have fun. This is the saying from our onsite manager who strongly believes we are the safest paintball field in the Adelaide area. We are known in the industry as being extremely safety conscious which gives parents and kids great piece of mind. Before games commence every player has a safety briefing, paint gun briefing & practice shots. Transport is easy to & from the field as we are located 2 minutes from Elizabeth Shopping Centre and approx 30 minutes from the Adelaide CBD. We are also right next door to Womma Train Station. Follow the Paintball Park Facebook page as you may see some great photos from the day. Bookings essential. We recommend bookings are made as soon as you know the day, as some days book are out weeks in advance. All players are required to complete a waiver form before playing. Players under 18 years of age are required to have their waiver form completed by their own parent. Waiver forms must be neat & completed 100% to be able to play. Waiver forms are available at the field on the day or Click here to open. Click here to watch a collection of paintball videos. View the various pricing options we have for you and your group for the day. Click here to make a booking at Paintball Park or make a Deposit.